Your batting skills are judged differently than just about anything else in your life. If you are successful only three out of ten times you are doing great. You know what happens when you only get three out of ten right in the classroom. Yeah, you have big problems. But getting three hits in every ten at bats will make you a great baseball player. 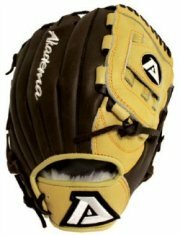 This article is going to tell you about some of the different types of batting drills available on this website. At the bottom of the article is also a listing of all the batting drills we offer. Well, as we all really know, hitting is not so easy. You are taking two round objects (a bat and a ball) and trying to hit them squarely together. That’s a tough thing to do. I think we need some good batting drills to help you out. So let's get started making a great hitter out of you. There are two things that all great hitters have in common. Number one, they have lots of confidence. And number two, they practice hitting a bunch. You get number one (confidence) by doing number two (practicing) a lot. The #1, hands down winner, numero uno best batting drill is hitting off a tee. Yes, that same tee you used when you were four and five. Using it and taking the same, continuous perfect swing off of the tee is one of the best hitting drills around. You noticed I said same perfect swing above. OK, it might not be a perfect swing. But you want it to be a quick, level swing that you are comfortable with. Practicing with a bad or wrong swing will just make you worse. Get down a good swing and then start hitting the tee. Check out the batting drills below for perfecting your swing. The other drills listed here are all good, sound hitting drills. But I'm not holding back from you the best practice drill. I gave you the best tip up front. Hitting a baseball is hard. And because of that there is only one right way to swing the bat and you will learn how here. Check out our detailed step by step instructions. Adjusting your batting techniques might give you big results. Check out our drills that will help you fine tune your swing. Baseball hitting drills need to improve the most important part of hitting. Check out these drills and learn what they improve. The batting tee is a great tool to work on other parts of hitting then just your swing. Find out how you can change a negative part of your batting into a big positive. 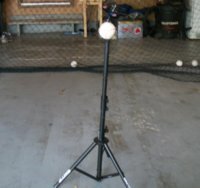 Take what you learn in the batting cages with you to live pitching. And it all starts with the batting tee. Yes, both pictures are of my switching hitting son. Here are some batting tips that will give you the confidence to get that timely hit. Go up to the plate knowing you will hit. 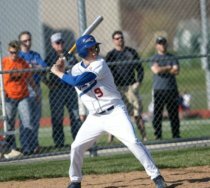 These baseball batting drills will improve your game and correct any swing problems you have. Trouble stepping out or uppercutting, we have the hitting drill to fix it. Hoping to improve your swing and your hitting? Then check out our baseball batting training. We offer great tips and exercises for improving your bat speed. Are you in a hitting slump? Then dig that old tee out, or have dad pick one up and get to swinging. This will clear your mind when you are at the plate. You can use any type of ball when hitting off the tee. 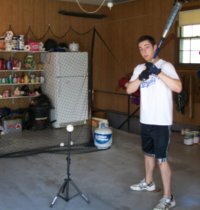 In fact, if you don't have a cage or netting to hit into, then hitting a wiffle ball works great. In fact, hitting a wiffle ball might be the best. When you hit a wiffle ball, it will over exaggerate a bad swing. If the wiffle ball is hit just right, then it will fly with no rotation. A spinning wiffle ball means you didn't quite hit it square. One of my sons made a team coached by the Kansas City Royals scouts. They would practice and play a few games at Royals Stadium. You know what they found in the Royal's practice cages? Batting tees. Yes, it is one of the tools the pros use to practice hitting. 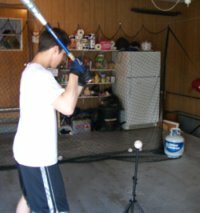 All the batting drills listed on this website are designed to make swinging a bat become natural. The whole idea is when you step up to the plate and have to face that hard throwing pitcher, you are not worried about your swing mechanics. 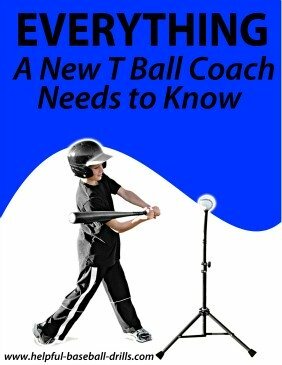 Even the new little T Ball player will feel more comfortable stepping up to the plate with some practice swings under his belt. Batting drills help players of all ages. Every good hitter takes a lot of good batting practice. 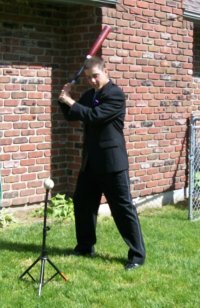 Here on the left I caught my son taking some swings before the High School Prom, lol. Actually, I had to talk him into letting me get a picture of him in his tux. Still a pretty good batting stance. There is nothing more fun than being on a hitting streak. And there is nothing more frustrating than being in a hitting slump. Many times the difference between a hitting streak and a hitting slump is just a slight adjustment here or a tweak there. Don't be afraid to shake things up and try something new. We each have our own special swing. Keep working to find the one that is best for you.